A couple days ago, we told you about the short-lived presence of the HTC Trophy on Best Buy's website. 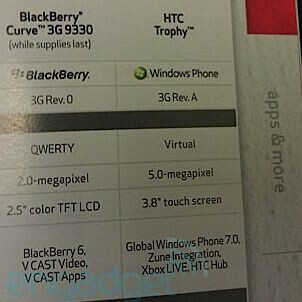 And while the Trophy isn't exceptional among the WP7 lineup, it is exciting to see it on Verizon. Verizon's enormous customer-base might be just what Windows Phone 7 needs to round the corner into mass popularity. And now an anonymous tip has us even more excited. A leaked Verizon document shows that the HTC Trophy will be a global device. Combining global capability with both Verizon's and Microsoft's reputations could make the Trophy incredibly popular among Verizon's business users. And with corporate acceptance might come the large-scale adoption that Microsoft has been craving. The only question might be the level of promotion which Verizon is prepared to offer. They've devoted so much attention to their beloved Android lineup, and now their iPhone, that we might not see as much collaborative marketing as Microsoft would like. didnt it already came ut in Asia?